"... I'm amazed at the quality... the best investment I've made in my kitchen... I used to get down on my hands and knees searching for items stuffed in the dreaded lower dead corner and the magic corner unit has that problem solved. And as described, it is very easy to install." While enjoying the convenience of the “L” shaped kitchen design, have you ever felt frustrated about the hard to access blind corner space under your kitchen bench? 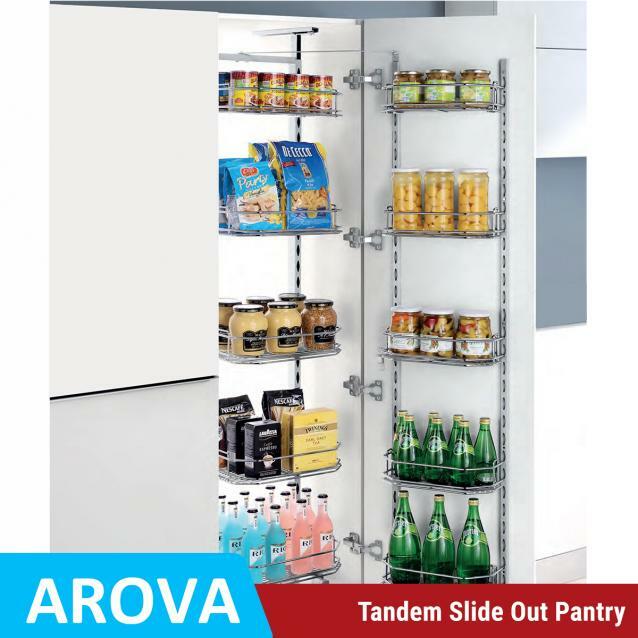 Turn your blind corner cabinet a truly magical corner for storage with this innovatively designed unit. Upon a light pull of the cabinet door, the door-mounted unit conveniently brings all your stored items within your reach. The unit and all baskets are completely adjustable in height so they can be tailored to cabinets of different sizes and your storage needs. Designed and engineered in Germany and manufactured in China by a worldwide industry leader, the unit features superb everyday practicality and exceptional craftsmanship in every detail. The unit provides a quiet and ultra smooth sliding every time even when fully loaded. The integrated soft close mechanism helps reduce impact and increases longevity of the product and cabinet. This unit including the soft close slides has been certified to have a minimum useful life of 50,000 open and close cycles when fully loaded. 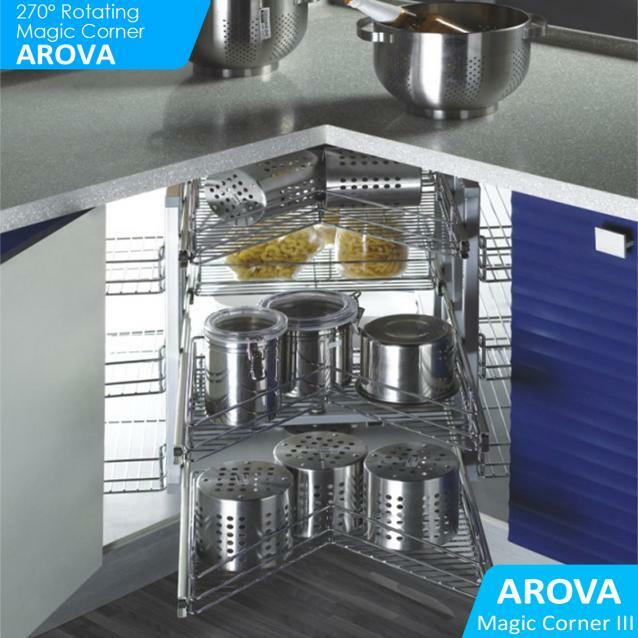 The Arova Magic Corner is available in left or right cupboard opening. The unit is very easy to install. This unit is supplied with drilling template so that you don't need to hire someone to install it for you. 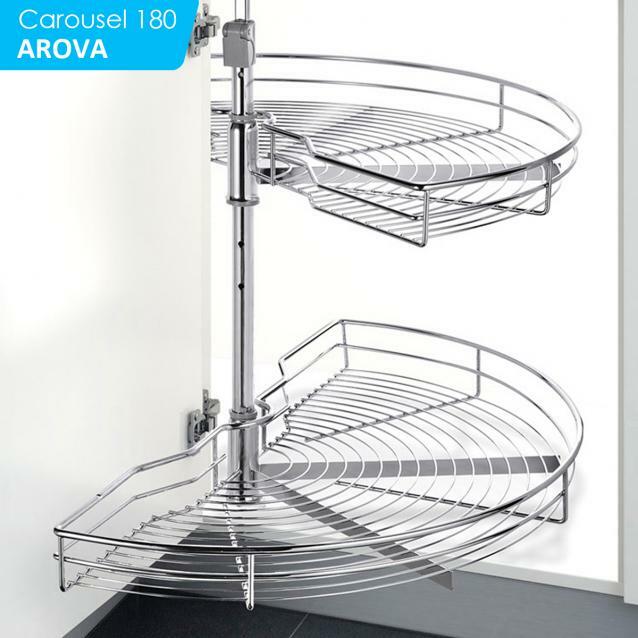 The Arova Magic Corner has an amazing load capacity as well – 22kg in total with 5kg for each small basket and 6kg for each large basket. So no worries for your heavy pots like 28cm Le Creuset. Organisation is important for kitchen storage as it helps maintain the good order longer and saves you a great deal of time finding things in need. With 12 compartments, you can say goodbye to the clutter as every item has their own place to go.